The Mojave rattlesnake is widely distributed throughout the Mojave and extreme northern Colorado deserts. It is found from 150 to 1500 m (500 to 5000 ft) in elevation in most desert habitats, especially desert cactus scrub, desert wash, and Joshua tree, and is most common in association with creosote. It seems to prefer desert flats over hilly or canyon habitat. This species is active from April until September (Stebbins 1954, Klauber 1972). Feeding: This snake feeds upon rodents (especially Dipodomys), lizards, other snakes, birds, bird eggs and some insects (Klauber 1972). It forages actively in the open and under bushes. Cover: The Mojave rattlesnake takes cover in burrows, presumably rodent burrows, as well as under desert bushes (Woodin 1953, Klauber 1972). Reproduction: This species uses burrows, presumably rodent burrows, for giving live birth to young (Woodin 1953). 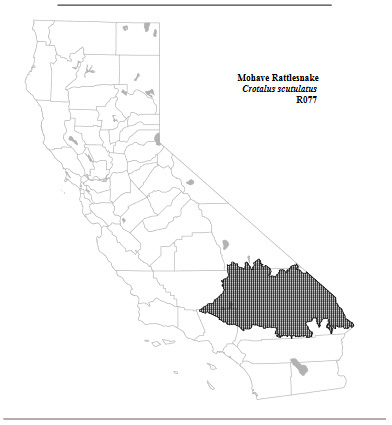 Pattern: The Mojave rattlesnake occurs throughout the Mojave Desert in a variety of habitats but is most common in scrub communities, especially creosote. It seems to prefer desert flats or very gentle slopes with few rocks. Activity Patterns: This snake is primarily nocturnal, but occasionally is crepuscular. It is active from April until September. In hot years, it may become inactive in mid-summer and may, or may not, re-emerge in fall (Stebbins 1954, Klauber 1972). Seasonal Movements/Migration: Probably does not migrate. Reproduction: Young are live-born in July and August. Litters range 2-11 and average 8 young (Klauber 1972). Niche: This species is probably taken by kingsnakes, roadrunners, and other avian and mammalian predators. General Comments: This is probably the most dangerous snake in North America. It is aggressive, fairly large-bodied, and has a complex venom composed of hemolytic and neurotoxic elements. It is responsible for several deaths each year, including in recent years a prominent snake toxin expert. This snake should be avoided. Klauber, L. M. 1972. Rattlesnakes: their habits, life histories, and influence on mankind. 2nd ed. Univ. California Press, Berkeley. 1533pp. Price, A. H. 1982. Crotalus scutulatus. Cat. Am. Amphibians and Reptiles 126.1-126.2. Stebbins, R. C. 1954. Amphibians and reptiles of western North America. McGraw-Hill, New York. 536pp. Woodin, W. H. 1953. Notes on some reptiles of the Huachuca area of southeastern Arizona. Bull. Chicago Acad. Sci. 9:285-296. The often mis-named "Mojave Green" has the most potent venom of any rattlesnake in North America. Its poison is about 16 times more powerful than that of the Sidewinder. They can be identified by their triangular-shaped head and diamond-shaped markings along their body, and of course, rattles. They are brown in color in the lower elevations and darken to a green in the higher regions near the mountains. Their eggs hatch within them so anywhere from 4 to 24 baby snakes are born live in a litter. The Mojave rattlesnake looks similar to a diamondback rattlesnake, having diamond shapes along its back. It�s color will vary from green-gray in higher, mountain elevations, to yellowish tones found more often in the lower portions of its range. Adults range from 2-4 feet in length. The creosote bush, found in the 2,000 to 4,000 foot elevation is the primary, but not the only habitat of this snake. They feed primarily on small rodents. It will not come looking for trouble, nor will it run from it! 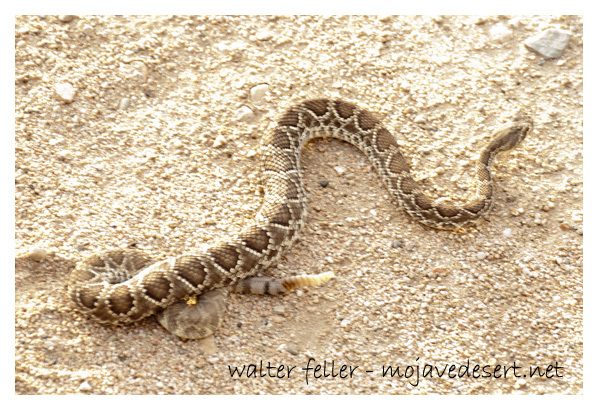 The Mojave rattlesnake is the most dangerous of rattlesnakes in the Mojave Desert. Its venom, which it uses to immobilize its prey and defend itself, attack both the nervous system with neurotoxins and the bloodstream with hemotoxins. Exposure to neurotoxins can cause loss of motor control, paralysis, and even death. Hemotoxins affect the blood or blood vessels: some destroy the lining of the smaller blood vessels and allow blood to seep into the tissues. Basically, the prey is immobilized and digestion begins from the inside out before the meal is consumed.